Friedrich Petzel Gallery is pleased to announce Strip the Auctioneer, the first solo exhibition of Berlin based Christian Jankowski. 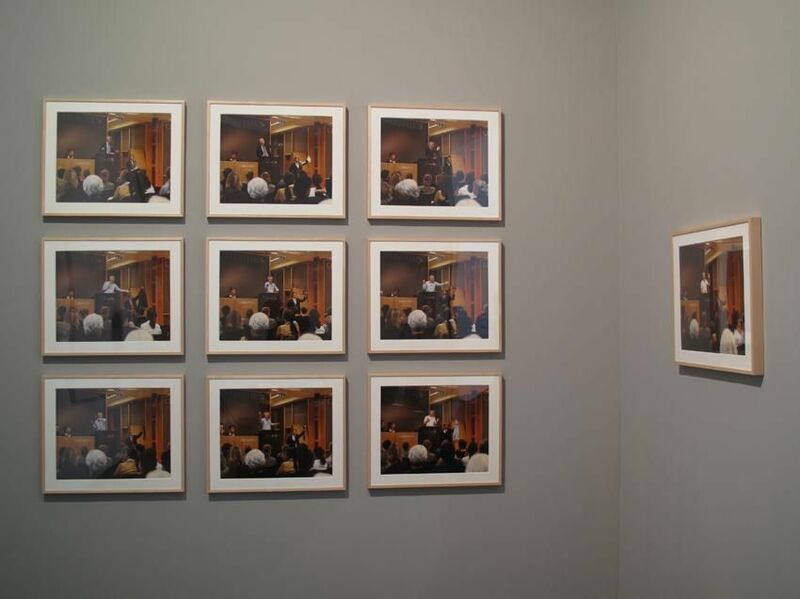 The art of the auction is center to Jankowski's installation, Strip the Auctioneer. 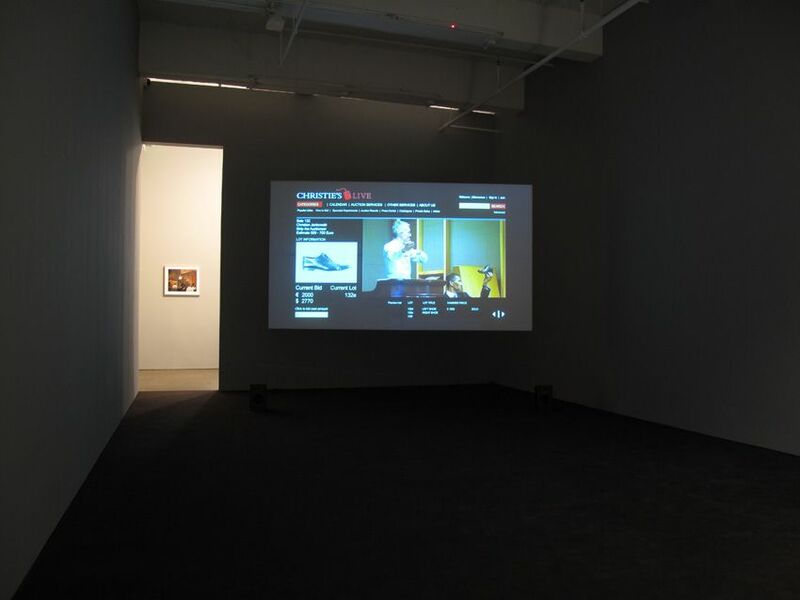 The gallery space, set in auction-house colors, contains sculpture, photographs and a video connected to a live auction that was orchestrated by Jankowski in May of 2009. 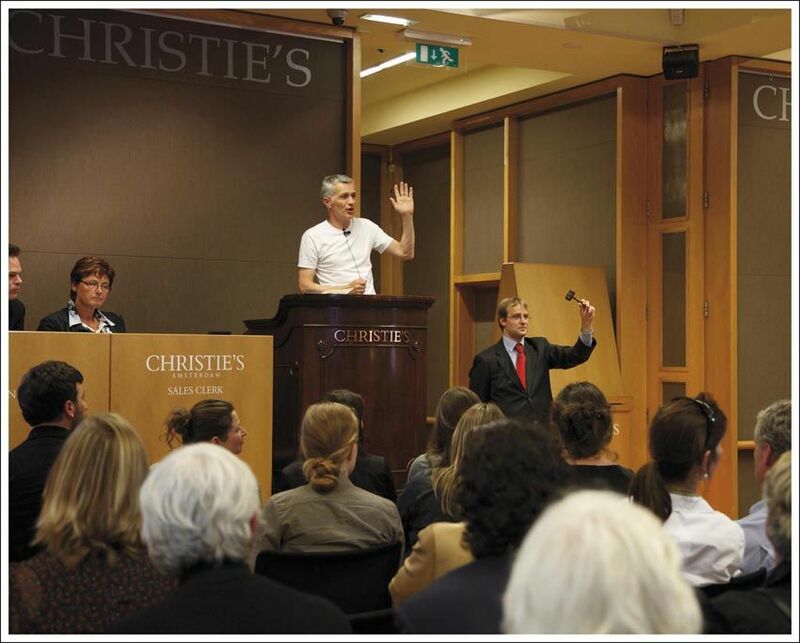 The action takes place at Christies auction house in Amsterdam and incorporates the auctioneer, Amo Verkade, as the desired possession. Verkade bids his garment piece by piece down to his hammer. 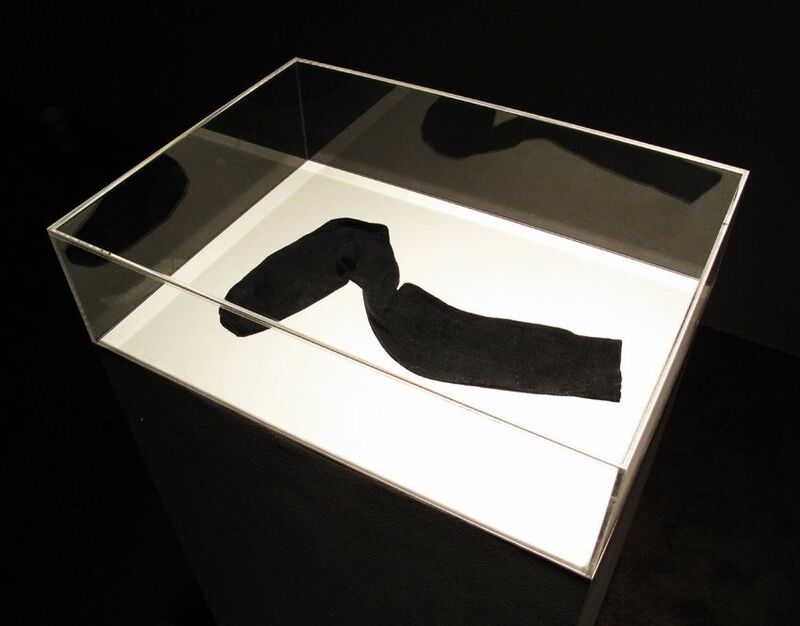 He strips himself of his suit, baring and transforming those parcels of clothing into objects of desire. Jankowski's auction-house burlesque seduces the public at first sight with sharp humor while at the same time questions the relationship between the economic and the symbolic value of art. It emphasizes the ambiguity of where exactly meaning and value resides. 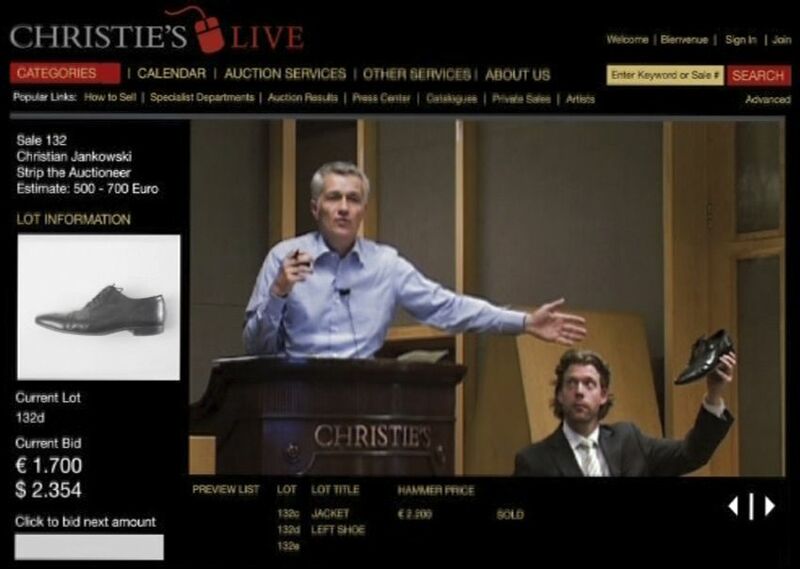 The distinction between fiction and reality highlights the inherent theatrical mechanics of the sales process, creating a live parody of the auction and its players. Strip the Auctioneer was part of Take the Money and Run, a project that combined an exhibition at de Appel arts centre with an auction at Christie's Amsterdam (May 2009). A catalogue published by Walter Koenig will accompany the exhibition. Jankowski lives and works in Berlin and New York and holds a professorship in Stuttgart. 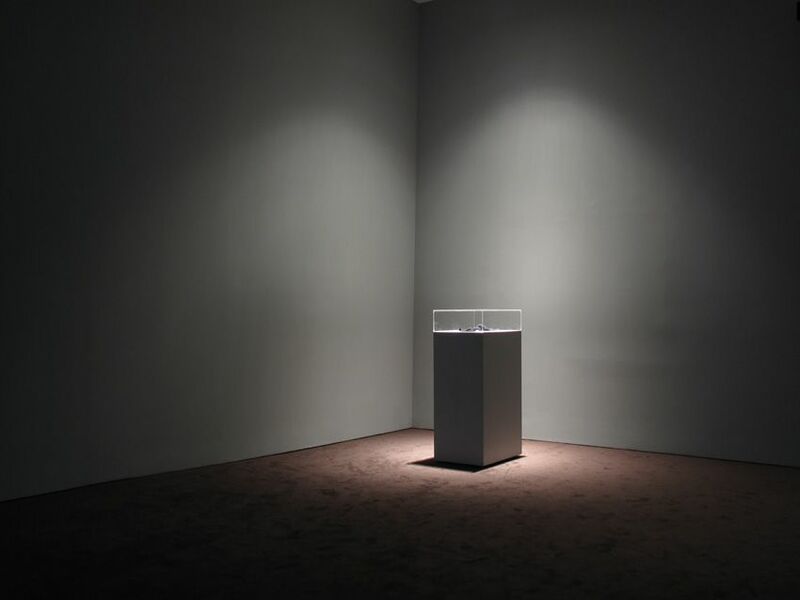 His videos, films, and installations have been exhibited internationally such as Temporaere Kunsthalle Berlin (2009), Nassauischer Kunstverein, Wiesbaden (2009) Kunstraum Innsbruck (2009), Kunstmuseum Stuttgart (2008), Miami Art Museum (2007), Museum für Gegenwartskunst, Basel (2003), the 48th Venice Biennale, as well as the 2002 Whitney Biennial at the Whitney Museum of American Art. This exhibition will be on view from March 4 through March 27, 2010 with an opening reception on Thursday, March 4th from 6-8 pm. Friedrich Petzel Gallery is located at 535 West 22nd Street New York, NY, 10011. For further information, please contact the gallery at info@petzel.com, or call (212) 680-9467.